It was that kind of game. This one gets an asterisk too, because with Kawhi Leonard out with an ankle injury, the Spurs looked nothing like the team the made the Warriors’ lives hell for the first 30 minutes of Game 1. 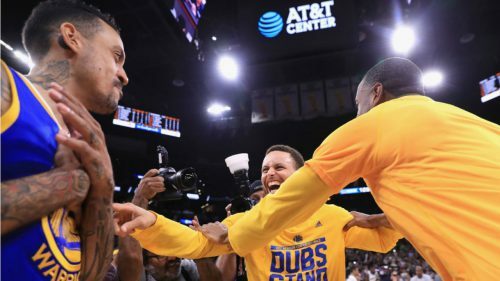 He is their linchpin on both defense and offense, and in his absence Steph Curry went immediately into Human Torch mode, scoring 15 points in the first quarter as the W’s went up 33–16. This game was never close and not, in fact, very interesting. But again, a win is a win is a win. The Warriors need only six more of them to hoist the trophy. 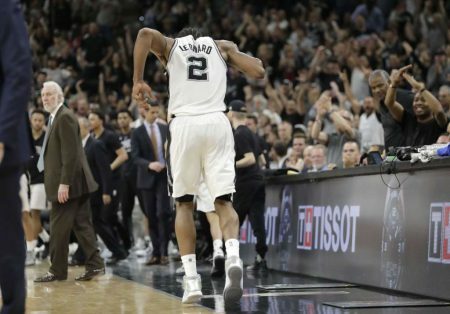 The hope all around is that Kawhi will be back for Saturday’s Game 3, making things a little more competitive. Meanwhile, the Eastern Conference Finals will finally get underway tonight, with the well-rested Cleveland Cavaliers facing the scrappy Boston Celtics. There are a lot of us hoping that the Celtics can provide at least a modicum of challenge for the defending champs; we shall see what we shall see. Now there’s something to write about. Yesterday My Golden State Warriors and Other People’s San Antonio Spurs met in Game 1 of the Western Conference Finals. 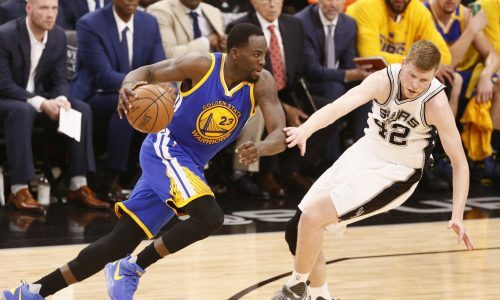 In the pregame show all the talk was about, do the Spurs have any chance at all against this Dubs juggernaut? Is it 80, 90, or 95% likely that the Warriors will win? 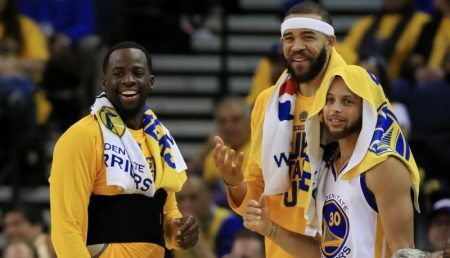 In one segment, Steph Curry, Kevin Durant, and Draymond Green’s mothers sat around drinking mimosas and talking like the title was already won. I myself was telling people that any bet on the Spurs was a foolish one, that with Kawhi Leonard playing on a questionable ankle, the series would not be competitive. This week I had the privilege of seeing Leslie Feist and her band perform at the Fillmore in San Francisco. It was a superb show in every way — punctual and professional but also joyful and inspired. She even resurrected “1-2-3-4,” the 2007 fluke hit from which she’s been running ever since. But the centerpiece of the show was a complete run-through of her new album, Pleasure. Like its predecessor Metals, Pleasure is an idiosyncratic piece of work that takes some getting used to, full of unexpected outbursts and sudden endings. But hearing it live really made it come, er, alive. And I came away really impressed with Feist’s guitar skills — I knew she had a great voice, but I never knew she could shred like that. Just five days after I mentioned Watergate in my last political post, Prez Von C. went ahead and fired FBI Director James Comey, stirring memories in many of the infamous Saturday Night Massacre. To which my immediate reaction, I must admit, was glee. I could care less about James Comey, whose fault all this is in the first place; but for FVC to make such a bold and desperate move, he must have something big to hide. A day later the euphoria has settled a bit, but still…whatever he’s trying to cover up, it’s bound to come out sooner or later. The only question is, will it be survivable? As Richard Nixon learned to his chagrin, you can’t just fire your way out of a crisis. Sooner or later the pigeons will come come to roost. The vultures are circling. I’m mixing my bird metaphors and I don’t care. Let the trials begin. 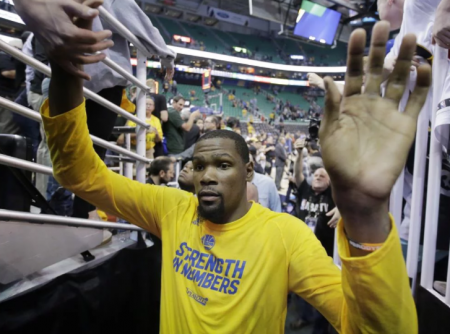 In the second round of the playoffs — a/k/a the Western Conference Semifinals — the Warriors slowly, methodically strangled all the life out of the Utah Jazz, a pretty good basketball team who just didn’t have the firepower to compete at the rarefied level the W’s currently occupy. It’s possible that no one does — with the possible exception of the Cleveland Cavaliers, who are also 8–0 in the playoffs, looming on the horizon like a coming storm. But in the meantime the Dubs will have to play the winner of the San Antonio Spurs/Houston Rockets series, now tied at 2–2. It is of course Wrong to look past any opponent, and those are both quality teams who are capable of causing trouble. But neither has looked what you’d call formidable up to this point, and the Warriors will get to sit back and rest as they fight a war of attrition. The only problem worth noting at the moment is the continued absence of Coach Steve Kerr, who had surgery this week to address his spinal fluid leak. This is less of a problem for us than it is for Steve, who has apparently been dealing with brutal pain throughout the season. I hope he feels better, whether or not he makes it back onto the court. In the meantime, the sun is shining, so I’m going to shut down this machine and go walk around in it. This week I’ve been reading Hunter Thompson’s account of the last days in office of Richard Nixon, and I find myself salivating a little bit. How long, oh Lord, how long, until Fuckface Von Clownstick is run out of Washington on a rail? Has he already committed the crime(s) for which he will be impeached and then pardoned by President Pence, or is that yet to come? I just hope it doesn’t take five years and a re-election for it to happen. There’s some major historical irony in the fact that the Watergate burglary was committed because Nixon was worried about losing an election that, it turns out, he won easily. One can easily picture FVC doing the same thing — so determined to win the popular vote this time that he signs off on election-machine hacking, widespread phantom voting, or the kneecapping of minority voters. Powered by WordPress v 5.1.1. Page in 0.109 seconds.